Are you completely assured you are hearing all the factual news? What if you were not, would you care? In our society, there are those who believe they are superior to all others in virtually every aspect of life; thoroughly convinced their opinions and ideologies are the only correct values; elevating them to true eminence. Safe in their bubble of reality, they speak down to the rest of us as if we are children, demonizing anyone who does not bow to their significance. They are the epitome of the self-endorsed authority, seeking an elite standing. It is purely their personas they look to promote and protect; enjoying their “drop the mic” moments, and being totally supported by their well tended assemblage. Who are they? As a retired communication industry executive, R.A. Roth has endeavored researching and analyzing mainstream media news reporting; with the primary focus being on the impact it has on our country. Coupled with this investigation, he has conducted countless informal interviews; paying particular attention to the influence the media has on the individual. He is a committed opponent to any attempts at social engineering; fundamentally authored by the self-proclaimed elite. 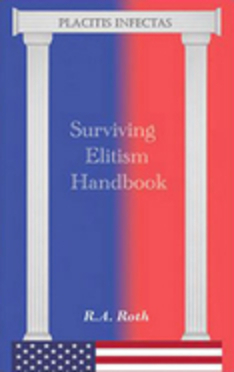 The results of this exploration is well examined in his first composition Surviving Elitism Handbook. Cover Photo © 2017 R.A. Roth. All rights reserved - used with permission. Outskirts Press amd the "OP" logo are trademarks belonging to Outskirts Press, Inc.